During the 2015 International Association of Official Human Rights Agencies conference in Alabama, PCHR Executive Director Rue Landau developed a travelogue about the discoveries she and her colleagues made. Those thoughts seemed even more poignant for this Election Day. Amid ongoing national commemorations of the 50th anniversary of the landmark Voting Rights Act, in Philadelphia, people are being enticed to vote tomorrow with a chance to win $10,000. 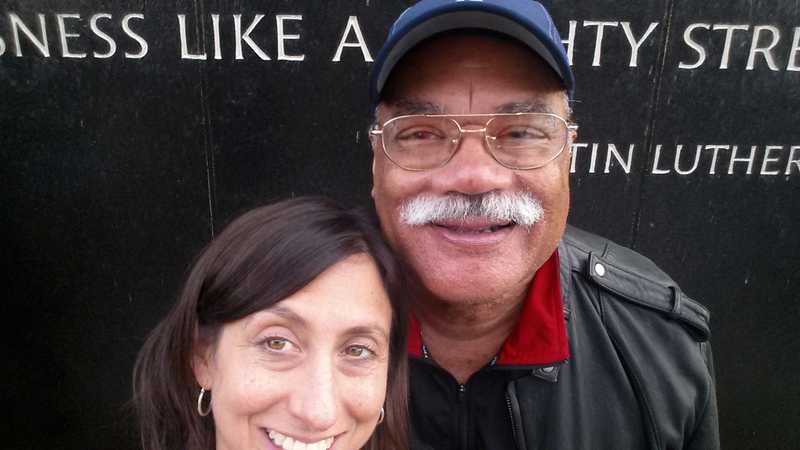 PCHR Executive Director Rue Landau poses at the Civil Rights Memorial Center with Julius Erven McSwain, her bus mate and a veteran investigator for the City of Omaha’s Human Rights and Relations Department. It comes in stark contrast of the tour of the Yellowhammer State Landau and dozens of others committed to social justice work traveled the routes to the places where men, women and children chose to stand for equality and fight for their right to vote, facing improbable and daunting odds. Among the hosts for this trip was Birmingham Mayor William Bell, who co-chairs the U.S. Conference of Mayors’ My Brother’s Keeper initiative, along with Mayor Michael A. Nutter. Bell also chairs the U.S. Coalition of Cities Against Racism for the conference. Those gathered heard from people such as former U.S. Attorney G. Douglas Jones, who led the cold case prosecution of former Ku Klux Klansman, some 40 years after their infamous bombing of the 16th Street Baptist Church and retired federal judge U.W. Clemon, who handled school desegregation cases throughout North Alabama, including the vaunted University of Alabama’s football program in 1969. He also was one of two African Americans elected to the Alabama Senate post-Reconstruction, in 1974. “For the past 150 years, states, mostly southern, have come up with schemes to overcome the 15th Amendment,” Clemon said. “That’s why we marched. That’s why the marching hasn’t stopped. His words blended in with those of iconic and hidden heroes of the movement, from the Rev. Dr. C.T. Vivian to youth activists-turned-marchers who today are keepers of the flame, such as Joanne Bland, who served as a tour guide during the conference. 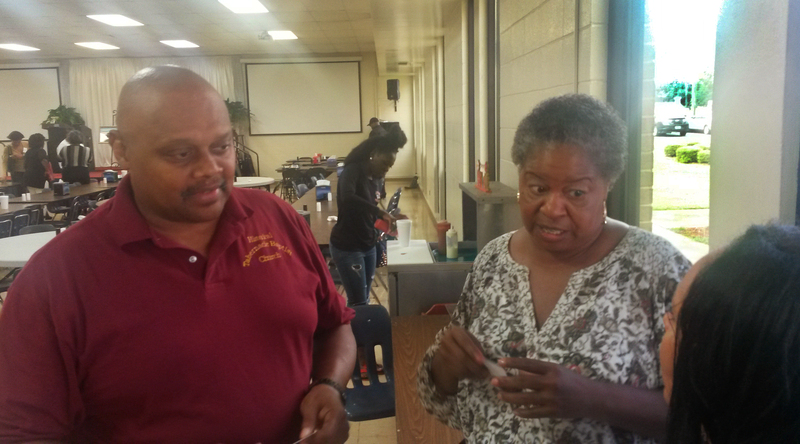 Kirk Carrington and Ruth Brown Anthony were youngsters during the march across the Pettus Bridge, but they were fully aware of what their actions meant. “When you don’t vote, it hurts me,” Carrington said. “It was our blood spilled on that bridge to get the right to vote, and now people don’t exercise that right?” Anthony added. The presentations were seminal for attendees such as Akia Haynes, deputy director and general counsel for the Indiana Civil Rights Commission. In addition to the speakers, there were a host of workshops and presentations, such as the session Landau moderated on community-police relations. For many of the participants, the entire IAOHRA conference was a powerful experience. “I’ve gone to corners of my mind that I’ve never been to before,” said Cheryl Sharp, deputy director of the Connecticut Commission on Human Rights and Opportunities. And it was deeply impactful for more than just the African American attendees. “This tour made it clear to me that this was not so long ago,” said Robin Toma, executive director of the Los Angeles County Human Relations Commission, one of the largest in the nation. “Despite the Voting Rights Act, people are still living in such economically deprived communities. “The real-life history tour was a life-changing, soul-feeding experience,” she said. “From sitting in the pews of the 16th Street Baptist Church to hearing directly from the people who marched and risked their lives to make the Voting Rights Act a reality. “I made connections from the past to the present that affirmed why our work is so vitally important. While discrimination and inequality are less overt now, attempts to roll back our civil rights and voting rights continue. “We must continue to zealously fight these efforts, to honor the struggle and sacrifices of those who came before us,” she added. Take a virtual trip with her to Alabama and look at our civil rights history with a new lens, through the text, photos and video that follow. Judge U.W. Clemon opened the conference with historical context on the struggle to win the right to vote and the modern fight to preserve those gains. Among the martyrs in the fight for equality were Four Little Girls — Addie Mae Collins, 14, Carol Denise McNair, 11, Carole Robertson, 14, and Cynthia Wesley, 14. — who died after the church was fire bombed in 1963. Justice would not come until 14 years later. A fifth girl, Sarah Collins Rudolph, grew to adulthood but still carries the scars of that horrible day. LA County Human Relations Commission Executive Director Robin Toma (l.) moderated a plenary panel featuring insights from thinkers such as Birmingham Mayor William Bell. Touring the barbershop where the Rev. Dr. Martin Luther King Jr. frequented whenever he was in town and needed a shape-up humanized him and the other crusaders of that time, and also contextualized the commonalities of past and present on several levels. The Gaston Motel served as ground zero for the strategists of direct action events such as the Montgomery Bus Boycott . The Rev. Dr. Martin Luther King Jr.’s room often transformed into a war room, where he and fellow planners organized and debriefed. This Greyhound station served as the site of the Montgomery bus boycott, and like many of the communities visited, looks almost preserved in time. The site of Bloody Sunday in America: Selma’s Edmund Pettus Bridge. A day of American resistance and push for freedom: Bloody Sunday in Selma. By any means necessary, these civil rights pilgrims paid homage to those who dared defy injustice 50 years earlier on the Edmund Pettus Bridge. “On my personal, spiritual level, a circle has closed,” said Norma Edelman, member of the Prince George’s County Human Relations Commission. in Maryland. She was among the dozens who took to the bridge as part of the IAOHRA tour. Gain a perspective from Joanne Bland, who at 11 years old was one of the youngest agitators marching across the Pettus bridge — and one of the youngest to be arrested during the Civil Rights Movement. This entry was posted in In Action and tagged 2015 PCHR Awards, Addie Mae Collins, Carole Robertson, Civil rights, Cynthia Wesley, Denise McNai, Four Little Girls, IAOHRA, International Association of Official Human Rights Agencies, Joanne Bland, My Brother's Keeper, Philadelphia Commission on Human Relations, Reconstruction, Rev. Dr. C.T. Vivian, Rue Landau, Sarah Collins Rudolph, Voting rights, Voting Rights Act. Bookmark the permalink.